I remember the day when I had saved enough money to put a down payment on a car. After graduating college, I secured a nursing position at a major Southern California hospital and began saving for one of the biggest purchases of my life at that time. But saving enough for a down payment was just the beginning of my venture into ownership. I had to walk through the process of securing a loan and ensuring that I could budget each month for my car payment. Thankfully, my parents provided support and guidance through what can be a confusing and overwhelming process. If you have the means to purchase a car in cash, I always advise against debt. But for most families, this simply isn’t a reality. Having navigated the car buying process at least 3 separate times, I have gleaned some important tips that can help you make the best decision when it comes to financing a loan. 1. Know Your Budget and Stick With It: Buying a car can be an exciting experience filled with emotion. You’ll want to walk into the process with a clear understanding of what you can afford in order to avoid being swayed by luxury features or a more expensive model. 2. Do Your Research Before Walking Into the Dealership: Knowing the exact car you want and how much you should pay for it will give you an edge when it comes to negotiating a deal. Also be sure to know your credit score and understand how it will impact the type of financing you will be able to secure. 3. Find a Lender Who Can Offer a Loan That Works for You: One of the most important items to consider when financing a car is the interest rate, which will often result in long-term savings. Opting for a credit union can result in interest rates 1-1.5 percent lower than banks and they generally offer more personalized service. 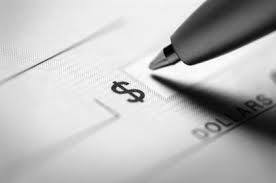 Additionally, credit unions are nonprofit organizations which means members receive profits in the form of lower rates and flexible loan options. 4. Opt for a Shorter-Term Loan: While a shorter-term loan means higher monthly payments, you’ll save overall and could secure a lower interest rate. 5. Put as Much Money Down as Possible: The ideal amount to put down is 20 percent, but any amount will help build equity into the car so that you don’t end up owing more than it is worth should you need to sell for any reason. As a Christian, it is important for me to manage my finances wisely and I strive not to have debt by living within my means. There are certain necessary purchases that often result in the need to secure a loan, such as the purchase of a vehicle or a home. 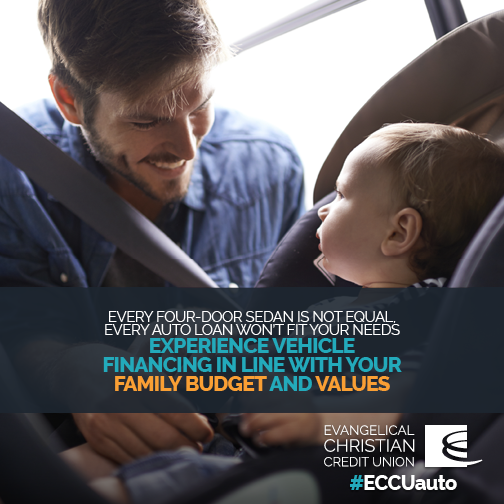 If your family will be purchasing a new car, consider The Evangelical Christian Credit Union, based in Orange County. Unique in the financial space, this credit union intersects faith and financial planning. ECCU offers business and banking services while investing profits in social causes. ECCU has serviced churches, Christian Schools, and Evangelical nonprofits and ministries with its specialized financial services for 50 years. Now families can secure an auto loan, open a personal savings account or a money market savings account through ECCU. 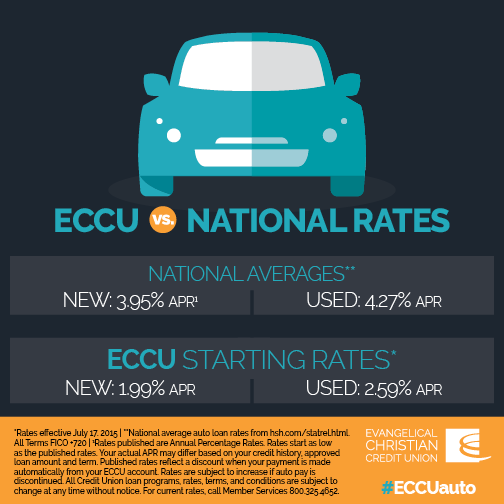 Some of the benefits of using affinity-based banking services like ECCU include auto loans without payments for 90 days, pre-approval for hassle-free shopping, and a 0.50 % discount for automatic payments from an ECCU checking account. You can open a personal savings account for $25 with no minimum balance. If you prefer a savings account with a higher rate, the Money Market Savings account gives you the opportunity to ear up to 0.95% APY2 on higher balances. What to Expect: Shop over 5,000 new and used vehicles (Ford, Lincoln, Mazda, Honda, Subaru, Jaguar and Volkswagon) with current factory incentives and incredible Labor Day Offers including loan rates starting at 1.99% APR1, no payments for 90 days, meet KKLA’s Big Wave Dave (11 am to 1 pm), and sign up to receive ECCU member offers including oil and filter changes for the life of your loan. If you are unable to attend the Galpin Motors Event or you would like to shop early, you can visit the location and shop from August 28th through September 7th, 2015. One of the most compelling reasons to opt for ECCU is that they help fuel Christ-centered ministry worldwide by providing loans to churches and low-cost banking services to missionaries and Christian organizations. If you want your money to make a difference, affinity-based banking through ECCU is a great way to be a good steward of all God has provided. For more information and practical financial advice, visit ECCU.org.